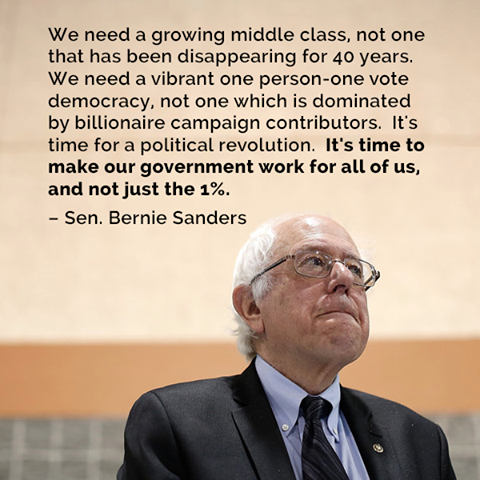 Bernie Sanders is truly a “people’s politician” and the real champion of the average American people. The issues he talks about are the same issues he’s been championing since becoming a Senator. He has a platform that is clear and straight forward and he is able to articulate it clearly for all to understand. Most important, he is not rich and is not beholding to any special interest groups. Bernie is taking his passionate message to the common people (99%) and I’m going to help him spread his message on this site. Plain speaking and honest. A rarity in politicians today. This entry was posted in Bernie Sanders and tagged Bernie for President, Bernie Sanders, Citizens United, Greed, Income Inequality, Inequality, Minimum wage, Socialist by Larry Shivers. Bookmark the permalink.